Just one block to Downtown Paso Robles where your wine tasting adventure starts. This one bedroom, with King size bed, one bath, lovely Carriage House boasts a great location, cozy interior, and wonderful gardens, on the grounds of the Historic Call Booth House. Relax and enjoy the front porch with a glass of wine from the Paso Robles Wine Region. Or you might BBQ with family that could be renting the 3 bedroom Call Booth House on the same property. Festival to name a few. Also surrounding the Park are many world class restaurants, wine tasting rooms, boutiques and theater. Paso Robles Wine Region has over 200 wineries to explore in some of the most beautiful country side that California has to offer. Hwy 46 West is will worth the drive and the scenery is beautiful as it takes you to the coast, were you can visit Hearst Castle, shop Cambria, fish Morro Bay, or walk the beaches of Cayucos. Call and inquire about concierge services such as spa or wine appreciation classes. This cozy vacation rental has all the comfort of world class Inn plus the benefit of privacy for you. We live in the Paso Robles area out in wine country on an 80 acre ranch (see Lekai Ranch Suite Vacation Rental #701796). 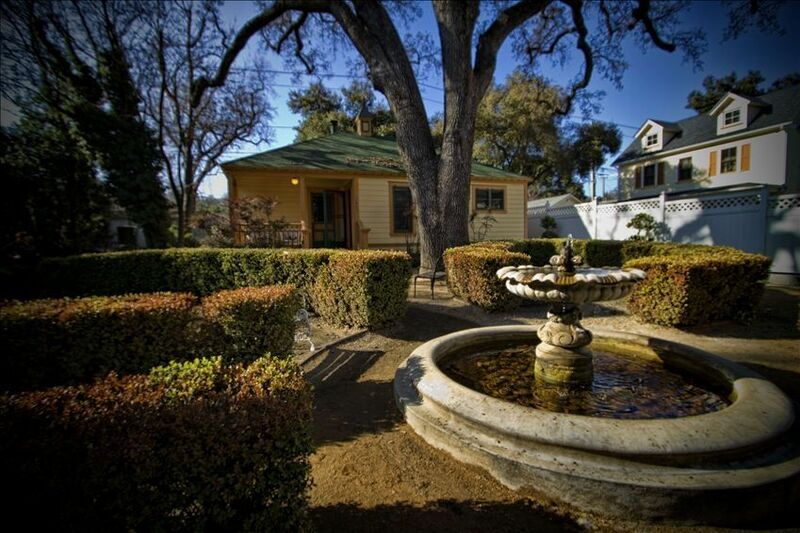 The Call Booth Main House and Carriage House are the most iconic residences in Paso nestled among century old oak trees and beautiful grounds. This property rarely changes hands and we were honored to have the opportunity to purchase these gems. Being located next to the historic downtown offers vacationers the ability to enjoy restaurants, shopping, cafes, galleries, the movie theater and more within a few minutes walk. The property is a well-loved landmark in Paso Robles. The Carriage House was built in 1989 in the style of the main house, the Call Booth House, which is a nationally registered historic landmark. Located only 1 block from downtown Paso, the Carriage House offers you the prime spot from which to fully enjoy restaurants, wine tasting, shopping, cafes, galleries, the movie theater and more. Vacationers are a few minutes walk from the historic downtown Paso Robles. My wife and I stayed here on a Saturday and Sunday night and we had a wonderful time. The place was clean and very well maintained. Everything from the sheets to the towels was high end. We loved that we were able to go out to wineries during the day, buy some great wine, then come back and cook dinner at the house and have the wine there. Also very easy access to downtown Paso Robles. Much better than staying at a hotel! The owner was also very gracious and accommodating. Highly recommend.